What are the major challenges in your business? Majority of our customers are brands and retailers based in Europe and US. The greatest challenge is reliability in supply. This has now been compounded with the need for quick response and increased flexibility in product offerings. Unfortunately, Indian apparel industry has had a legacy of poor reliability. Why was ensuring “reliability”, “flexibility” and “speed to market” a tough challenge operationally? We market intermediary products in addition to garments, therefore available capacity of the plant was shared between catering to needs of market (yarn/fabric customers) and internal (Garment) requirements. This and the inability to synchronize various items needed for completing orders was creating disruption (erratic cycles of starvation and overloading) in flow of yarn and fabric required for garment orders. So in spite of high WIP, expensive finite scheduling software and frequent expediting meetings there was a high and highly variable lead-time and orders could not be dispatched in time. Like others in this business we tried to solve the problem by under loading the plant but this squeezed profitability. What motivated you to embark on the TOC journey? As I mentioned, we are in a very time sensitive and competitive market. And we found that our due date delivery performance was inconsistent. Airfreight & penalties, lack of affirmative action to grow the business due to inconsistent supply was causing us considerable losses. Additionally, customers have been consolidating their supply chains and had been threatening to pull out unless we delivered. To survive and succeed in this very tough business, we knew we had to improve operations in a very short time! With the help of TOC we aimed to enhance performance and thereby profitability by building a competitive edge based on reliability with considerably lower lead times, whilst possibly getting more output from same capacity. What were the paradigm changes implemented? The most important change is that now our entire supply chain is realigned to ensure reliability of customer orders. Output improvement in the plant became the welcome side effect! For this we completely revamped our operations. First, the focus of the company itself was changed. Amongst the three lines of businesses we have, Garment manufacturing and supply clearly became the top priority. Fabric sales was completely stopped and yarn was made to subordinate to the garmenting requirements with some capacity dedication for strategic yarn customers. Second WIP is now capped at a reduced level (compared to before implementation) to ensure that there are fewer orders on the shop floor thus forcing the departments to complete work on the orders in hand. This enables planning to be conservative and spare some capacity buffer, while allowing execution to aggressively use any unused capacity and maximize output. Third, there is a clear and visual priority system in place based on relative closeness to due date which dictates expediting on the shop floor and at vendors. Our core issues arose from the fact that the various departments were blind to how local decisions were affecting the fate of orders. So, these three steps, which define the boundaries within which local considerations (for productivity) can prevail without delaying orders, now ensures that operations are always working on correct orders. What has been your experience after implementing TOC? Now customers receive their orders on time and in full assortment with a considerably reduced lead-time. This is motivating them to continuously increase our share of business. Key customers who require orders in even considerably lower lead-time are offered deliveries in Half the normal Lead time. 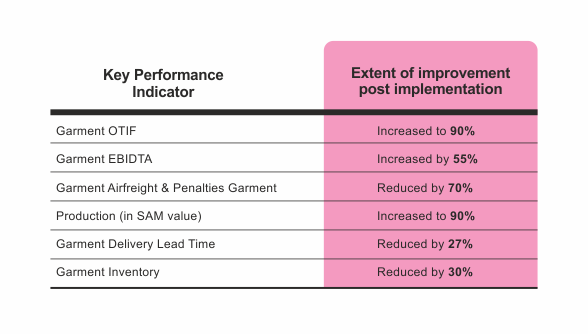 The existing system can deliver this without hampering other normal lead-time orders. Further, the shop floor exigencies used to consume a major share of senior management time. Now the system is largely working on “Auto Pilot” with very little intervention needed from senior management. This has released our bandwidth significantly and we are now able to focus on the future. We have now been able to invest and strengthen and reap the benefits of an enhanced Product Design & Development Studio with design support centre in Europe. Considering India’s edge as a low cost supplier is eroding, by building agility into our operations, we aim to become a company of choice for the global fashion garments in the export market.